The latest fiscal analysis from IDC reveals Apple had remarkable improvement in the number of iPads shipped from the same point last year, but Samsung and ASUS showed even stronger growth in the same time period. Apple's iPad shipments grew to 17 million during the second quarter, an impressive jump from the 9.2 million shipped during the same period in 2011. Those 17 million iPads surpass Apple's previous record of 15 million sold in one quarter, with those sales coming at the end of 2011. However, not to be outdone, Samsung and ASUS both had much more growth year-to-year than their larger competitor. Samsung may have only shipped some 2.4 million tablets, but that number was more than a 117 percent increase from the same fiscal period in 2011. 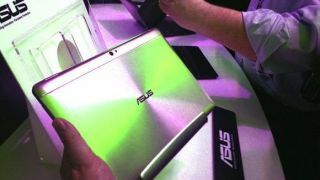 The same could be said for ASUS, which moved a little more than 855,000 units, yet managed to increase the amount of tablets they shipped during the new fiscal period by more than 115 percent. Overall, the total number of tablets shipped during the second quarter is estimated at 25 million, amounting to nearly 34 percent more than all companies moved combined during the first quarter of this year. Year-to-year, those same 25 million total units show growth of more than 66 percent over 2011, when 15 million tablets were sold in the second quarter. Four of the top five tablet makers saw incredible growth over 2011's numbers, with Acer being the only company to see a decrease in units shipped. Though the iPad still holds a seemingly impregnable 68.2 percent market share for tablets, the massive improvements of both Samsung and ASUS are hard to ignore. Add in the upcoming addition of Windows 8 tablets to the market and it'll be interesting to see if Apple can continue to outpace its competition so dramatically.